The General Atomics MQ-1 Predator takes great pride in being recognized by the Air & Space magazine as one of the top ten aircrafts that changed the world. This multi-mission, medium-altitude unmanned aerial vehicle (UAV), which was first flown in 1994, is currently in service with the U.S. Air Force (USAF) and Central Intelligence Agency (CIA). 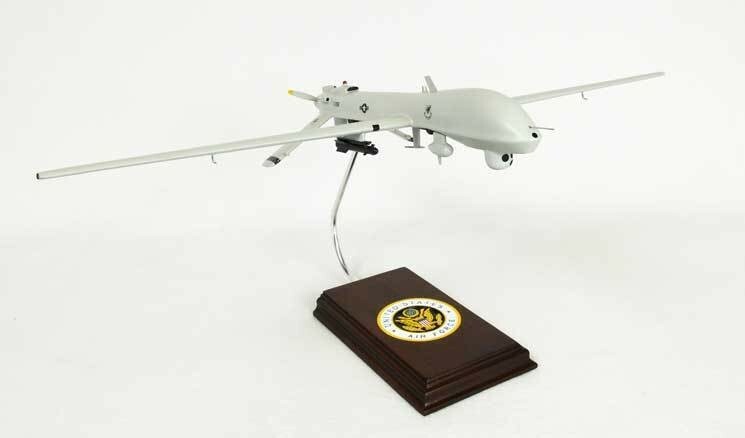 Since it was originally designed to perform reconnaissance and forward observation roles, the MQ-1 Predator was equipped with cameras and sensors that were later modified and upgraded to be capable of carrying and firing missiles or other ammunitions. The US military refers to it as a “system” because this drone aircraft is made up of four air vehicles with satellite communications, sensors, and a ground control station that remotely operates the said plane. Because of its unmatched reliability, the General Atomics MQ-1 got the highest operational readiness rate in the USAF. It is also used by the U.S. Navy, U.S. Government, as well as the Italian Air Force and has seen combat over several nations. There’s no better way to pay tribute to this legendary aerial vehicle than to get this museum-quality aircraft replica that’s handcrafted by expert model makers with precision and careful attention to details. It is sculpted, sanded, painted, and finished based on scale drawings to faithfully mimic the full-size aircraft. Since it looks similar to the original, this scale model aircraft also makes for a perfect gift to someone who loves history and aviation or is just fond of collecting scale models.